The earliest galaxies in the universe can help us understand the way the universe itself forms and forces that affect that formation, and that’s exactly what astronomers have discovered. What’s even more interesting is that those galaxies are located at our galaxy’s doorstep. A team of scientists from the Institute for Computational Cosmology at Durham University collaborated with the team from the Harvard-Smithsonian Center for Astrophysics to detect the earliest galaxies in the universe. They found evidence of the faintest satellite galaxies that are orbiting the Milky Way galaxy. They suggest that the galaxies called Segue-1, Bootes I, Tucana II and Ursa Major I belong to the group of galaxies that were the first to ever form in the universe, being thought to have formed over 13 billion years ago. At the time when the universe was roughly 380,000 years old, the atoms started to form, those being hydrogen atoms, which is the simplest element in the periodic table. As time passed, the atoms were gathering together and formed clouds that cooled gradually, setting small “halos” of dark matter that arrived from the Big Bang. The cooling phase itself is called the “Cosmic dark ages,” which lasted a pretty long time, roughly 100 million years. When enough time passed, those clouds began forming stars that belong to the earliest galaxies in the universe. Dr. Sownak Bose from the Harvard-Smithsonian Center for Astrophysics, Dr. Alis Deason and Professor Carlos Frenk from Durham University’s ICC successfully discovered two populations of those satellite galaxies that orbit our own. The first of those populations came to life as a result of “cosmic dark ages,” while the second one represented a slightly brighter population of galaxies that formed much later, after hydrogen ionized as a result of ultraviolet radiation that came from the first stars. Their work is published in the Astrophysical Journal. “The (re)ionization of hydrogen in the early universe has a profound effect on the formation of the first galaxies: by raising the gas temperature and pressure, it prevents gas from cooling into small halos, thus affecting the abundance of present-day small galaxies,” the team wrote in the journal. 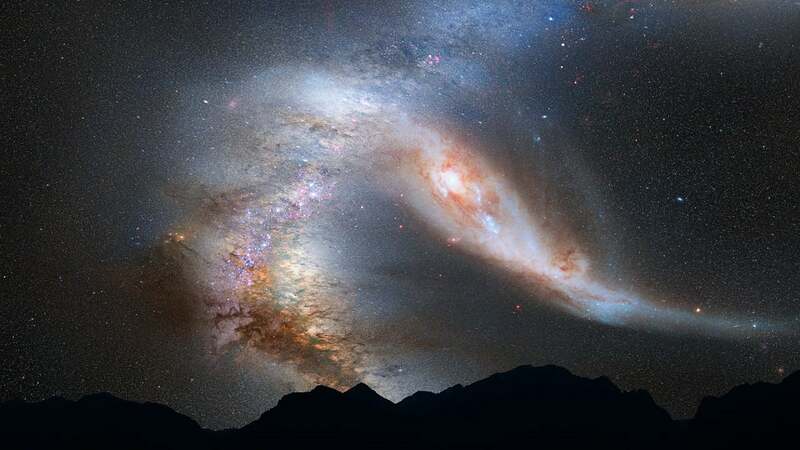 To describe how the galaxies form in the universe, researchers refer to the “galaxy evolution model” that predicts that something triggered the transition between the fainter galaxies and those brighter ones, one of which is the Milky Way, the galaxy where our solar system resides. The ionization of hydrogen perfectly fits into the model that the team uses, which is exactly what the team found in the data they used for the purposes of the study. The first group of galaxies emitted strong ultraviolet radiation that destroyed the remaining hydrogen atoms by ionizing them. That way, the gas couldn’t easily cool down, which would result in new stars being formed. That said, no new galaxies could come to life as a result of that. On the other hand, the halos that previously formed from dark matter grew mass to the point that the ionized gas was able to cool, so new galaxies continued forming, resulting in intensively bright galaxies like our own. “A nice aspect of this work is that it highlights the complementarity between the predictions of a theoretical model and real data,” said Bose, who was a Ph.D. student at the ICC at the time the research began. “This is a wonderful example of how observations of the tiniest dwarf galaxies residing in our own Milky Way can be used to learn about the early Universe,” Dr. Alis Deason, Royal Society University Research Fellow at the ICC, Durham University added. As per report in BBC, professor Carlos Frenk explained that given they are some of the earliest galaxies in the universe and they formed in a unique way, they should contain some unique properties that would describe them. “If you go and examine these primitive galaxies, you should find bizarre things about them. Being the first ones, they should have properties that are unique to them, professor Frenk was quoted by BBC. When the Big Bang emerged, the only elements that we currently see in the Periodic table and were present at that time were hydrogen and helium, the first two elements in the table. Other, heavier chemical elements were produced as a result of reactions inside stars. This would usually happen when a star would go supernova, the galactic environment that gets filled with other chemical compounds. Nevertheless, the availability of different elements in the cosmos has changed since. That said, it could be possible that the way different elements were distributed in the earliest galaxies in the universe doesn’t fit the way they are distributed in galaxies that formed after reionization. With this in mind, the team can continue cherishing their study and working on discovering new galaxies that could hide the answers about the universe formation, and unveil various secrets that we are still not aware of.